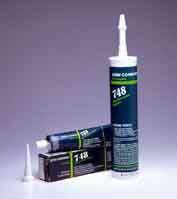 Dow Corning® 748 Noncorrosive Sealant – Off-white neutral (noncorrosive - alcohol) cure one-part RTV sealant especially for electrical sealing applications such as power and control connections, motors, cover plates, instrument lenses, regulators, junction boxes, control panels; sealing refrigerator and freezer liners. Use to keep wiring in place and seal motors from environmental contamination. Meets FDA 21 CFR 177.2600, NSF 51, NSF 61, UL listed, 94 HB. Continuous temperature range from –65 to 300°F (-54 to 150°C); intermittent to 350°F (177°C). Container sizes: 3 oz tube, 10.1 oz cartridge, 4.5 gallon pail. Dow Corning® 732 Multi-Purpose Sealant – One-part, nonslumping, RTV sealant for general purpose bonding and sealing of flashing, vents, flues, electrical boxes, ductwork, and to prevent flange leaks. Meets FDA 21 CFR 177.2600, NSF 51, NSF 61, UL listed, MIL-A-46106. Continuous temperature range from –75 to 350°F (-59 to 177°C); intermittent to 400°F (204°C). Available in clear, white, black, and aluminum. Container sizes: 3 oz, 4.7 oz, 10.3 oz tubes, 10.1 oz cartridge, 4.5 gallon pail, 52 gallon drum. Dow Corning® 730 Solvent Resistant Sealant – One-part white fluorosilicone (solvent resistant) RTV sealant for bonding, sealing and caulking where resistance to fuels, oils and solvents is required. Used for fluid-filled distributors and transformers. Resists swelling when exposed to fuels, oils and most solvents over a wide temperature range. May corrode certain metals; does not adhere to concrete or masonry; not for use in direct contact with highly polar solvents such as acetone or methyl ethyl ketone. Continuous temperature range from –85 to 400°F (-65 to 204°C); intermittent to 500°F (260°C). Container sizes: 3 oz, 4.7 oz tubes, 5.75 oz Semco cartridge.